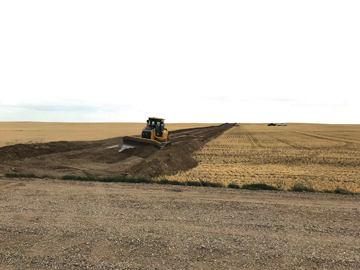 SUPPLIED PHOTO CONSTRUCTION BEGINS: A bulldozer works on an access road Monday for the Whitla Wind Farm, south of Bow Island. Capitol Power has announced the contstruction of the 56-turbine renewable energy facility is proceeding after final approval from regulators was granted in late August. Jerry Bellika, director of government relation for Capital Power’s Whitla Wind Farm, and other project staff members presented an update to Bow Island town council on Jan. 28. Phase 1 of the 201. 6 MW project, south of Bow Island, is a part of 12 wind farms that have been constructed since 2012 and got the go ahead for the construction from the Alberta Utilities Commission (AUC) in September 2018. Access roads to the site were being bulldozed as soon as the green light was given and crews were able to pave eight more roads than anticipated because of the good weather. -Calgary-based Rising Edge Technologies (RET) were contracted to do the work and were able to carve out 30 Km of permanent road and 55 Km of temporary crane paths and construction roads during the building period. Roads are expected to be complete in later 2019. -A 224-MVA transformer’s arrival is expected in March, back feed power in July and a September completion. The Operation and Maintenance building, which is adjacent to the Shamrock substation is expected to be completed in March. Local economic impact will include 250-300 workers, Laidlaw Sand and Gravel with the supply of gravel for roads and foundations, GVN structures for the maintenance building. RET and the County of Forty Mile with road construction. Forty Mile Rail will be transporting in the Vestas wind turbine components from Stirling. The village’s lay down area for the parts. Ongoing 2019 site preparation will include more access roads. collector line installation, concrete foundation pouring, transportation of wind turbine components to sit and wind turbine assembly. Turbine delivery will be from the middle to the end of 2019. There will be 616 truckloads of major components from staging area in Foremost and 200 loads of smaller components of equipment coming in. Council passed the third and final reading of the Utilities Rate Bylaw. Water rates remain at $20 a month for commercial, residential and multi-residential units, sewer service rates went up $2, waste collection rates increased $4 and the recycling fee went up $0.50 to $3.